Here I began by spritzing a piece of card with water and then dropping Spun Sugar and Festive Berries Distress inks onto it. I also tapped a little mica powder onto the wet surface. When dry, I stamped the Stamploration flowers with Versamark and embossed them in gold. I added more deep red ink to the petals and then added Glossy Accents to the centres and tipped micro beads into the liquid glue. I thought his looked a little insipid, so I added some Gold Aqua Tint ink to them and dropped a few spots onto the remainder of the background. The panel was cut with a Simon Says Stamp stitched rectangle die and mounted on a dry embossed black layer, similarly cut. The Memory Box dragonfly was cut from gold textured paper plus a second layer of wings from vellum, which I dry embossed to add a little veining and then inked with gold ink. The sentiment is from Tattered Lace. It will be so interesting to see the various interpretations of this Muse card! I shall look forward to visiting everyone! Hola Chrissie, your card is stunning and very dramatic...wonderful!!!. Your card is a really challenge this week!!!! My oh my this card is amazing! I absolutely love it. Fabulous colours, stunning design. Love your card is stunning!! Chrissie this is SOOOooooo gorgeous! I saw this card over at Muse and had to pop over to exclaim all sorts of compliments over it! I definitely will be trying to play along with this one! And I definitely will be hitting the follow button over here! Chrissie! This creation is absolutely gorgeous. 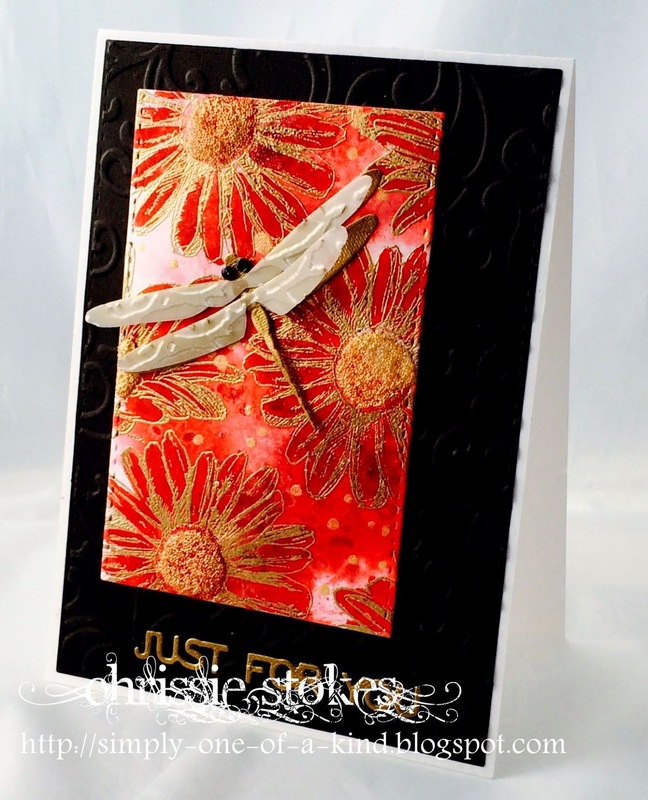 The reds are so striking, and the gold embossing on top of your fabulous distress inked panel is perfect. I just love it! This is just gorgeous ! Such a beautiful card and love the gold embossing! This is STUNNING!! Love the deep colours with the gold. Absolutely brilliant design Chrissie!! I can't wait to see what others do either. This is so outstanding that I'm not sure anything can measure up. Oh wow, the daisies look fabulous embossed in gold, Chrissie! This is such a stunning card! Hugs! Stunning card! Love contrasting colours of the embossed gold and red!